A woman tries to survive while protecting her children when just looking upon the world may cause madness, murderous episodes, then suicide. 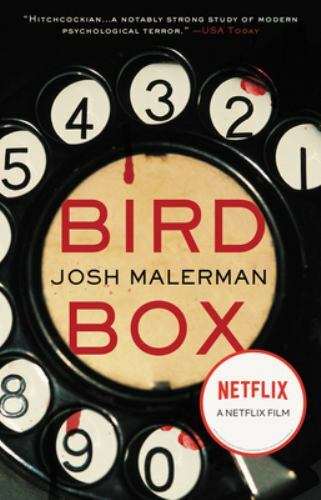 In 2014 singer / songwriter Josh Malerman published BIRD BOX. The story is told from the perspective of Mallory. It starts with her and her two four-year-old children escape from their home, under cover of fog, to a row boat on the river to find safety... ALL WHILE BEING BLINDFOLDED. But why would anyone do anything so insane? Because something in the world creates madness within the beholder that stirs a murderous rage and ultimately suicide. The rest of the story is a "split screen" that bounces back and forth between the trek along the river and the events that lead to the current world at large. What was excellent about this book was the way it was developed. You didn't have those questions eating away at you, what happened? where did it come from? WHY?!?! As the tale is very Lovecraftian in nature, madness sets in when you see something your mind does not have the ability to reconcile. The only recourse is madness and death. Of course, if you were already insane, this new world is your oyster. You can gaze upon this invasion of Earth with impunity. Of course, those already mad want to do all they can to share the word of sight with those who are less willing. This book is compelling reading and kept me turning the pages. The mixed use of tenses was a style that Malerman used that bothered me at times, but didn't stop me from reading. This is, of course, the book that the movie is based upon, so it's fun to read so you can compare and contrast. It definitely gives you a better idea of what is causing the hysteria, but can never tell us WHY. I was fine with that.